Main sponsors for this event is Wisdom Tales Press, Lee & Low Books, Chronicle Books, and Susan Daniel Fayad: Author of My Grandfather’s Masbaha. As someone who values and strives for diversity in my own reading, I was very excited to learn about this initiative. It's important for all readers, but especially for young readers, to be exposed to a wide berth of stories and characters. With recent research confirming what we avid readers already knew (that fiction is a key for developing empathy), developing a broad and strong foundation at an early age is all the more valuable. To shine a light on the diverse literature already out there, participants in the Multicultural Children's Literature Day were given books to review. I was lucky enough to receive a copy of We're Riding on a Caravan: An Adventure on the Silk Road by Laurie Krebs and Helen Cann (Barefoot Books), and I can't imagine a more appropriate book for the occasion. 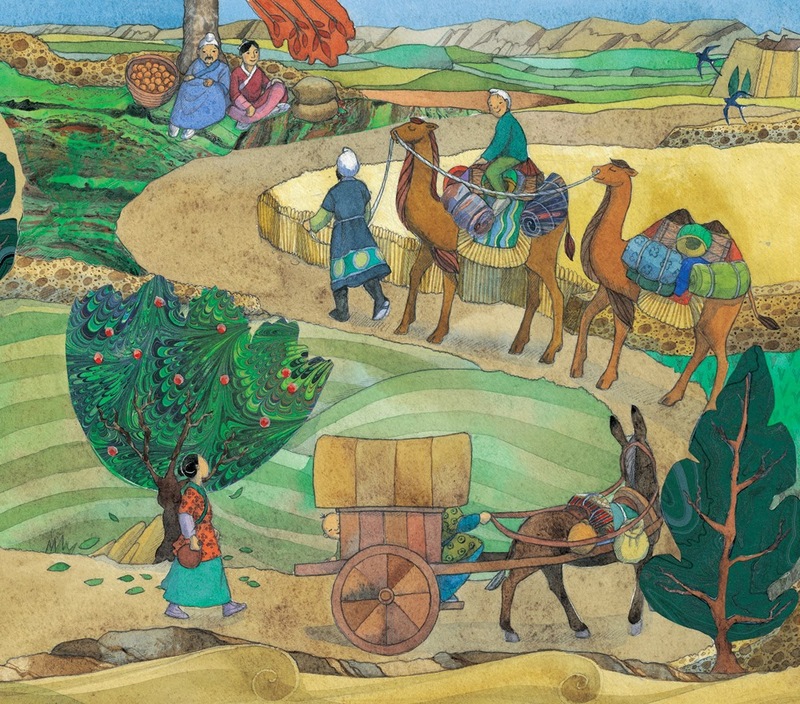 A richly-illustrated story about travels along on the legendary Silk Road, the book shows merchants setting off from their homes loaded up with wares, looking to exchange them for goods from afar. The book is an easy read-aloud as it repeats variations on a pleasant chorus ("We're riding on a caravan, a bumpy, humpy caravan, We're riding on a caravan to places far away.") that feels like the kind of thing you would all sing together on a long journey. 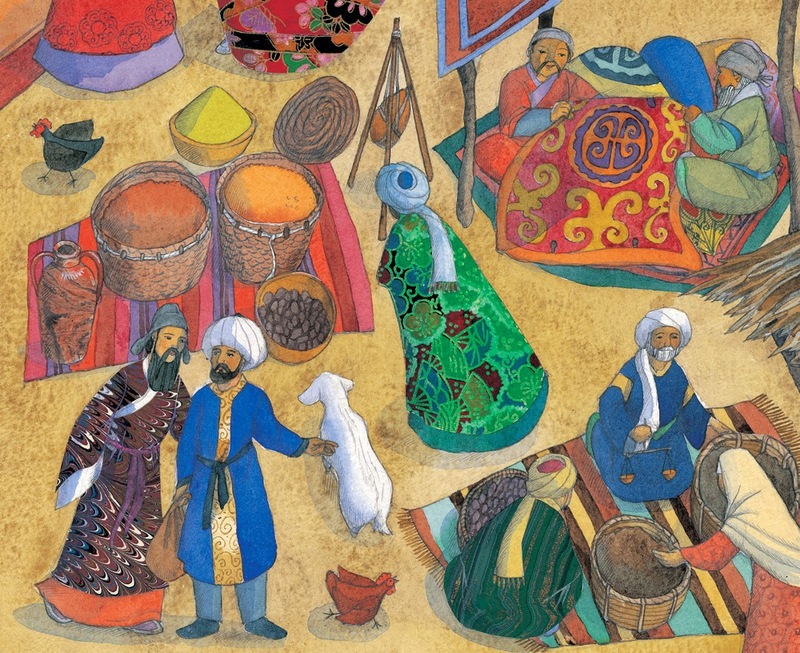 The book is a particularly fitting one to mark a Multicultural Children's Book Day because the Silk Road was instrumental in bringing together cultures from all over the world and became the mechanism by which religion, art, and ideas were exchanged. With technology being what it is today, it may no longer be necessary to load up a wagon full of wool or spices in order to experience other cultures, but the spirit of the Silk Road remains one worth emulating. If you truly want to have a rich experience with a variety of cultures, you have to make the effort and get out there. Readers (as well as publishers, booksellers, and other book professionals), should commit to our own Silk Road and make sure that we venture beyond the immediate village of our own experience, always searching for new stories. There are broad social implications at play here, but more fundamentally, this a personal obligation. The great myth/misperception is that "multicultural" literature is meant only for readers of the particular culture being portrayed. This narrow mindset is a disservice to everyone and can have devastating implications for the book industry. Multicultural literature is not and should not be confined to specific demographics. The more widely you read, the more quickly you come to realize that while the settings and details may differ, great books have intrinsic value for any and all readers. 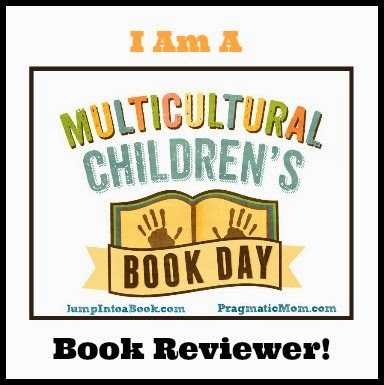 So, as we celebrate Multicultural Children's Book Day, I hope you'll take some time to poke around these other sites; fellow vendors along a Silk Road of Reading. More importantly, I hope today's celebration represents just another stop on this long and wonderful (if sometimes bumpy and humpy) road to seeking out and enjoying stories from all corners of the world.